With over 20 years experience we know what makes a good pitch. Studies have shown that the ball is affected by both the carpet and the conditions of the base. As we only use the best quality carpets produced under controlled conditions in the UK and also supplied for ECB installations we have that part covered. With regards to the base, the ball is directly influenced by the first 100mm depth. Dependant on your site conditions we would normally recommend a 50mm hard porous base of finely selected aggregate, incorporating a 75mm stone sub-base. This ensures that you have a consistently graded depth of at least 100mm. Our shockpad is then recommeded to protect the base and add further consistency before surfacing with either our Premier or Play Carpet. 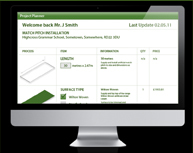 To get a quote simply use the project planner and follow the easy step by step guide.